Indeed we have conveyed to you One Liner GK and Current Affairs - 8th June 2018. 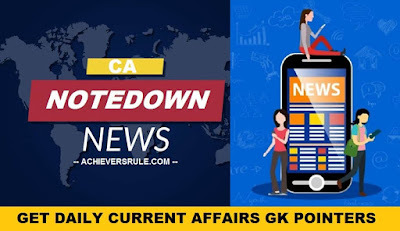 These are an arrangement of Latest News Headlines with GK Points in light of the essential news have been specified toward the finish of the article. These are critical for the up and coming examinations of IBPS PO, IBPS CLERK, SSC CGL, SSC CHSL and other comparable examinations. Applicants ought to experience these in subtle elements to gather itemized data on some particular points. Additionally, take after the Daily Current Affairs Updates and Daily Current Affairs Quiz all the time. World Oceans Day is celebrated on 8th June. The Reserve Bank of India (RBI) has made changes in the Gold Monetisation Scheme (GMS) to make it more attractive. The RBI said that the Interest subsidy scheme on short-term crop loans of up to Rs 3 lakh will be implemented through the DBT mode from the current financial year. The West Bengal Government decided to invest 107 crore rupees to check erosion at vulnerable areas along the banks of the Ganga and the Padma. The government has sent another letter to social networking giant Facebook, seeking explanation of the issue of data sharing without explicit consent through its platform. President Ram Nath Kovind visits Tripura with basket of gifts and Inaugurates national highway and declares “Queen Pineapple’ as state fruit. The Himachal Pradesh government decided to do away with semester system in under-graduate courses and revert to annual examination system. Minister of Youth Affairs and Sports Rajyavardhan Rathore has approved the upward revision of pension to meritorious sportspersons. Minister of State for Defence has dedicated a highway tunnel at Theng near Chungthang in north Sikkim to the nation. Islamic State terror outfit has killed 22 pro-regime fighters including 11 soldiers in surprise attacks in Syria. Raksha Mantri Nirmala Sitharaman accorded approval for the procurement of equipment for the Defence Forces valued at over Rs 5500 crore. In a bid to give a big push towards the ease of doing business in the State, Punjab Government has launched a "Business First Portal" which was unveiled by Industry Minister Sunder Sham Arora. Prime Minister Narendra Modi will leave for a two-day visit to China tomorrow to attend the Shanghai Cooperation Organisation- SCO Summit.